Do you make cards for Valentine's Day? Now that my kids are older, I don't make much. I'll give them each a card with a little treat but that's about it. But I do use a lot of love themed/hearts in my memory keeping so I was excited to see the Painted with Love Suite in the Occasions catalogue. I must admit I wasn't sure what I would think of the dsp - I'm really not a fan of pinks and purples but this paper is stunning. The gold foil accents really make the dsp. The other thing I love about it is that the back has almost a grungy feel so you get two different looks. You could go for elegant and classy or laid back and grungy. I can't wait to make some layouts with it! Be sure to check out the entire collection because there's lots of great products that are meant to coordinate. You can find them on pages 18 and 19. One of the items that is part of this collection are these adorable Narrow Note Cards. They measure 2-1/2" x 4-1/2" and are meant to tuck nicely inside the box that you can make with the Lots to Love Framelits. I believe these are a bit too small to pop in the mail but they will be the perfect size to add a little note to hand deliver. For today's card I used one of my FAVORITE patterns from the Painted with Love Specialty dsp - it's coral/peachy colored with gold brushstrokes. SO pretty! 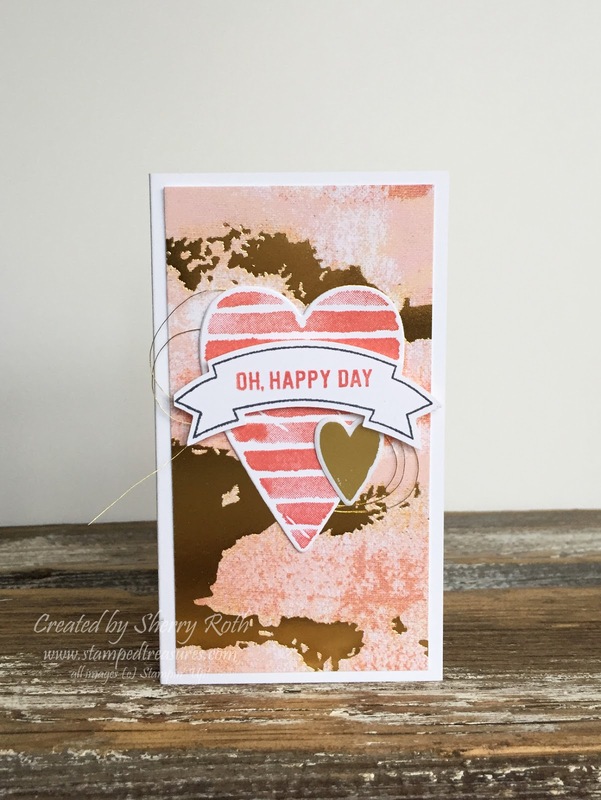 That was added to the center of one of the Narrow Note Cards, added a heart stamped using the Heart Happiness stamp set. The gold heart is one of the gold vinyl stickers that are part of the collection. The greeting and banner come from the Thoughtful Banners stamp set. I decided to do something a bit more generic and stamped Oh Happy Day so that I can use it for anything, not just Valentine's Day! What are some of your must haves from the Occasions catalogue?